I well remember the feeling of disgust when, on the 18th stage of the 2004 Tour de France, Armstrong chased down a six man break that included Filippo Simeoni. This move would, of course, ensure that the break would be neutralised by Ullrich’s T Mobile team. Showing himself to be a far better man than the Texan Simeoni agreed to go back to the peloton so that the break could succeed. When back in the bunch Armstrong, showing his support for the code of Omerta that has brought the sport to its knees, made a zip the lips gesture. On the final stage a defiant and brave Simeoni attacked continually but was, of course, chased down by Armstrong’s lackeys. And what was the cause of Armstrong’s ire? Simeoni used to be treated by doctor Michele Ferrari, who was also Armstrong’s doctor, and had testified in court that he had doped since 1993 and that Dr. Ferrari had prescribed him doping products such as EPO and Human Growth Hormone in 1996 and 1997. Simeoni was later suspended for several months for doping use. Armstrong was, of course, under pressure because of his association with Ferrari and reportedly called Simeoni a liar in an interview with Le Monde in July 2003. Unsurprisingly Simeoni lodged a charge of defamation asking for damages that he would give to charity. On Sunday Simeoni showed his true worth when, with a late attack after 255km, he beat the cream of Italian cycling to take the the road championship. The thirty six year old from Milan repaid the faith of his small team with the best win of his career. This letter to cyclingnews.com caught my eye as I am planning to build another bike and my favourite bar is only available in 26mm which seems so yesterday. OK it is only one man’s opinion but it is good enough for me, I am sticking with standard bars. No, your eyes are not deceiving you; all Oval Concepts sponsored teams ARE riding 26.0mm “standard” sized bars and stems. My personal (and therefore our company) philosophy is that “Oversized = Fatter, Heavier, Slower”. There is no reason to add more weight or frontal area to your road bike and the Pros know it. The Oversized 31.8mm “standard” is a bad Italian fashion developed when the Italians did not have the efficient butting and swedging technology to offer a safe, reasonably priced, 220 gram road bar. Now that everyone has high quality, reasonably price, triple butted alloy bars made in Asia, and good companies make good carbon fibre road bars in 26.0, O/S 31.8 should die – at least for road bikes. The strange thing is that all our sponsored teams since the company was founded, including Silence-Lotto, Slipstream and even the old Liberty Seguros squad asked for 26.0. We make both sizes as the market right now demands both sizes but I did not ask nor demand that our teams use either size. Big Magnus Backstedt is not afraid of breaking his Oval 26.0 bars and stems on his TT bike for the Tour or his road bike for Paris-Roubaix. Robbie McEwen demands bars that are super stiff for his incredible power sprints and he loves our R701 classic bend bars in 26.0. I repeat, there is no reason to add more weight or frontal area to your road bike and the Pros know it. Thanks for the eagle eye. Frank Schleck was heading for the yellow jersey and a possible stage win at today’s stage of the Tour de Suisse when fate intervened. Just four km from the finish Schleck was leading co-escapee Marcus Fothen down a tricky descent when he failed to get round a bend and dragging a foot along the ground he hit the Armco barrier and disappeared over the edge! Fothen managed to avoid Schleck and continued for the win 45 sec ahead of the chasers including race leader Anton. Franck Schleck trailed in about three minutes later and as he finished he kissed a gold medallion he was wearing, presumably dedicated to St Christopher. He was interviewed in English saying he expected to be stiff in the morning but he appeared to be unscathed save for a few minor scratches on his arm. A remarkable feature of the incident was that although brother Andy was with the chasers he didn’t bother to stop yet an Astana rider stopped to check that Frank was OK. You can see his lucky escape on YouTube. 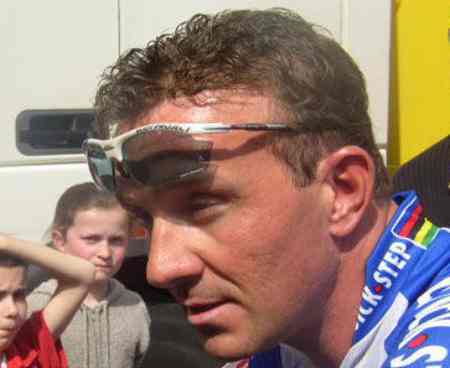 Johan Museeuw speaking about the Boonen scandal tells it like it is The 1996 World Champion said he had ben surprised to hear that Boonen had used cocaine. “I thought that Boonen had a strong character, but today he proves that he is also just a man. I do not understand how an athlete who has the character to win Paris-Roubaix can’t withstand that temptation.” Nor can I Johan but heh, kids are so weird these days. No, nothing to do with cocaine. What was he thinking of? Tour de France green jersey Tom Boonen has been barred from next month’s race in the wake of a positive test for cocaine. Tour director Christian Prudhomme announced on Wednesday that Boonen would not be at the Brest start line on July 5 because his positive test for cocaine which although not performance-enhancing, damaged the reputation of the race. Boonen, the winner of last year’s green jersey for the race’s points competition, tested positive in an out of competition control by the ministry of the Flemish Community on May 26 days before the start of the Tour of Belgium where he won the final stage. Because the control was not undertaken by a sports body Boonen cannot be suspended although he risks a substantial fine. The news of Boonen’s cocaine positive, which emerged just as Quick Step announced they would be given another three years of their sponsors’ money, prompted the Tour of Switzerland to withdraw Boonen from the invite list and It was then almost inevitable that Tour officials followed suit. The Tour has required all participating teams to sign a ‘good conduct’ charter by which teams agree not to select riders whose conduct risks damaging the image of the Tour. Lefevere had earlier sought to distinguish between “real doping problems” in cycling and the difficulties of a “private” nature of their star. A team statement later read: “In the last 24 hours there have been several conversations with the representatives of ASO. “The team is sorry to have not been able to meet the representatives of ASO before the decision was taken, considering that the result of the test undergone by Boonen won’t have any consequence on a professional and sporting level.” Prudhomme agreed, but added: “It’s not a case of performances being improved, this is something that has happened in a social sphere well outside of sport. “Tom Boonen is a big champion but a big champion must also be exemplary.” In a statement read at the start of the press conference Boonen apologised for the pain caused to his team and his family. “I’m not going to defend myself here today but I hurt my family, my friends and my team and I apologise,” said Boonen. “I’ve been in the news recently in a negative way. I’m not perfect and I’ll accept the consequences. I’m now going to get some rest and I can count on the confidence of my team. [this presumably refers to the fact that Boonen has, in the last six weeks, twice been suspended from driving for speeding. On one occasion he was doing 160kph in a 90kph zone] “I hope that the fans will continue to support me. They will soon be able to count on my unreserved commitment.” Fine words from Tom but it should be noted that Mrs Boonen’s brush with the law reported on greenjersey at the time was concerned with an allegation of cocaine use by Tommeke. The Flemish Community, in charge of doping controls in the Flanders region, said they will not be taking any action against Boonen, nor will he face International Cycling Union (UCI) sanctions. “If the information is confirmed as it is an out-of-competition control, UCI rules like those of the World Anti-Doping Agency (WADA) do not provide for any sanctions for cocaine,” a UCI spokesman said on Tuesday. It seems that Boonen has paid the price for failing as a “role model” whatever that means. A recent press release from the University of Leuven shows that the fight against doping is a never ending battle. When they move to the stage of testing on humans I don’t suppose there will be a shortage of volunteers in Flanders. Somebody should tell the researchers to reject men with shaven legs. Leuven, Belgium − Many patients with a chronic disease or cancer have to contend with anemia and the severe fatigue that accompanies anemia impedes the patient considerably in his or her daily activities. At present, the hormone EPO is administered to a large number of these patients to alleviate the anemia. But unfortunately, treatment with EPO is not always effective, and not all patients respond to this therapy. VIB scientists connected to the Katholieke Universiteit Leuven have been researching the role of the Gas6 protein. This substance has proven successful in the treatment of mice with anemia, without causing the side effects that the use of EPO entails. In addition, Gas6 contributes to a reinforcement of EPO’s effect. Gas6 might possibly form the basis for a new treatment for anemia and offer a remedy for patients where EPO is ineffective.